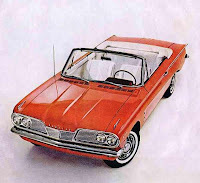 The Pontiac Le Mans started life as a luxury and performance package for the mid-sized Tempest coupe and convertible, and left this world as an economy compact coupe. It first appeared in 1962, as a high-end package on the Tempest, with carpeting on the floor and door panels and bucket seats. A new V8 engine revved it to 190-hp for a sportier ride. The Le Mans is perhaps best known for introducing the Pontiac GTO to the world. This too was first sold as package on the upscale Le Mans, boasting a stiffer suspension, dual pipes, Hurst floor shifter, performance tires, and a 389 V8 hitting 260-hp. Though the Le Mans had already been a popular car in the Tempest lineup, the GTO proved the big success, not only ushering in the muscle car era, but boosting Pontiac's industry standing in sales. With a lasting influence on the pony car market, the GTO would disappear after 1974. In the meantime the Le Mans branched out its offerings to a sedan and Safari wagon, along with the coupe and convertible. Stepping out from under the shadows of the Tempest, the Le Mans became its own stand-alone brand in 1971, when the Tempest was discontinued. It came in a variety of trims that emphasized either luxury or performance, offering up hefty V6 and V8 engines. As the '70s progressed, the Le Mans got even bigger, until the oil embargo forced a detuning of engines. The big block V8s shrunk a bit, as did sales for the Le Mans. In 1982, the mid-size coupe, convertible, and sedan were dropped, its place taken over by the Bonneville. The Le Mans made a brief return for six years, from 1988-1993 as a compact coupe and sedan. Though not the performance car it once was, with only a 4-cylinder engine that either got 74 or 95-hp, it tried to package its GSE coupe with superficial street racing elements. This new Le Mans boasted great fuel economy, a roomy cabin and trunk, and an overall reliability that made it a favorite with budget-conscious students and first-time buyers.